Whether in the early stages or more advanced season of dementia, your family member’s condition brings with it many concerns. Due to dementia’s effects on the memory and cognition, many individuals living with the condition are at increased risk of forgetting important, everyday necessities. Home care and dementia often go hand in hand because of the ways that home care can help aging adults enjoy life safely at home. Unless dementia is severe and accompanied by other extreme challenges, aging adults living with the condition do not necessarily need to move into an assisted living facility. Most adults with dementia prefer to remain in the comforts of their home. The familiarity of their home can also be easier as they struggle with memory issues. If you, like many, believe your loved one would prefer to live at home and can remain in place safely, then home care is a helpful option. Home care and dementia fit well together because the services provided through home care agencies are versatile. Home care is non-medical, focusing on offering support to aging individuals to help them live safely and comfortably in their own place. Several everyday matters can be risky or problematic for those living with dementia. A caregiver from a home care agency can offer support to help, reducing your need for concern about your loved one. 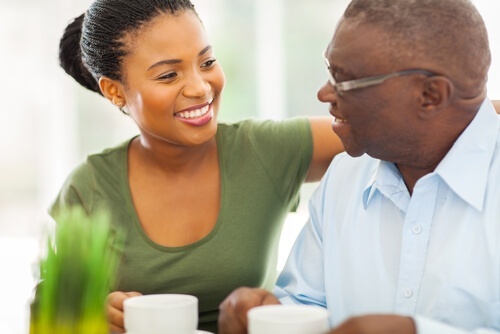 One of the most common concerns family members have about loved ones with dementia is the misuse or mismanagement of medication due to forgetfulness. Difficulty with memory can also make it challenging for your loved one to remember if and when they’ve eaten, performed personal hygiene, or experienced medical symptoms. A caregiver can help address all of these issues. Caregivers provide an extra set of eyes. They can also offer medication reminders, provide light meals, help with personal hygiene, and make notes to track these activities. As dementia progresses, many adults living with the condition find that even if they can drive, they can’t remember where they have been, where they are going, or how to get there. At a certain point, most people with dementia also have problems driving safely in general. Caregivers often serve as personal drivers and escorts for aging adults. They can help remind your loved one of appointments or activities outside of the home and then can transport them there and back safely. A caregiver can even attend some activities, like visiting a religious service, alongside your loved one. Even those without memory challenges can struggle with loneliness during the later seasons of life. Individuals with dementia are often at increased risk of depression related to loneliness, especially if they need regular visitation in order to reassure them that they have not been alone for long. A simple service provided by many home care agencies is companionship. Whether that means playing cards, completing crafts, or simply visiting to chat is up to you and your loved one. Companionship can help your family member by ensuring a friendly face is regularly checking in. Besides addressing common problems experienced by those with dementia, home care is a healthy choice because it increases personal safety. When a caregiver is regularly present, checking in, and helping a family member living with dementia at home you gain peace of mind knowing your loved one is safely enjoying life. To learn more about helpful home care and dementia services, download this free Guide to Home Care.